Lasbela district comprises of five Tehsils and 22 Union Councils and its spread over 15,153 square kilometer, according to the 1998 Census. Lasbela has a coast line which is renowned for its beauty and picture perfect scenery but apart from that the District has one burning issue that is ignored continuously. The issue is of illegal drug use or the drug abuse amongst the youth of this underdeveloped District. 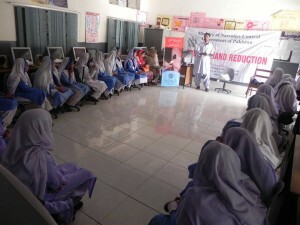 To address this burning issue, Narcotics Control Division’s Drug Demand Reduction Cell in Collaboration with the Education Department has taken a very good initiative of educating the youth through “Awareness session about Drug Abuse Prevention among Youth” in the Government run High schools of the District. 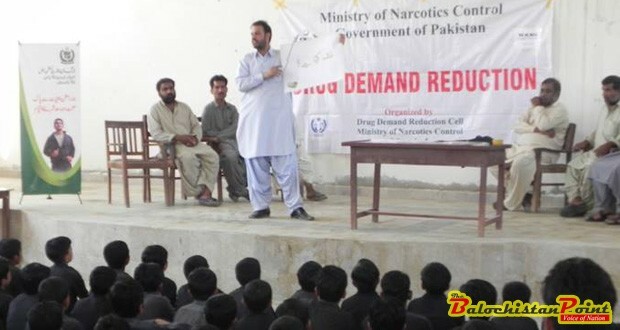 The initiative, although very unique and new in the context of Balochistan, is a very good step towards reducing the danger of drug abuse amongst the youth. These activities are more interactive compared to the conventional style of awareness sessions. Interactive sessions are those with a higher degree of active participation by all students, through discussion, brainstorming or skills practice, as opposed to those focusing largely on teacher presentations and teacher-led discussion. These awareness sessions were focused on drug abuse and its impact on the family, health and psychological well-being of addict; particularly youth. There are particular health risks associated with drugs misuse in adolescence, which is a sensitive time for brain development. Students were engaged in these sessions, from the beginning, in order to create their interest in the topic and to give an idea about the ultimate consequences of drug abuse. These were very well planned session, covering most of the aspects related to drug abuse and its ultimate cost to individual in term of his family, health, personality disorder and psychological fitness. It is worth mentioning here that these activities are important because Balochistan Province shares its boundaries with Helmand, Kandahar, Nimroz and Zabul provinces of Afghanistan which are producers of majority of illicit opiates. The province is also one of major transit route for these drugs due to which the number of drug users are also very high and unfortunately, according to the Report of Drug Use in Pakistan, 2013, Balochistan has high opiate use prevalence, at 1.6 percent, although drug use estimates for Balochistan are conservative due to lack of data collected beyond the provincial capital of Quetta.